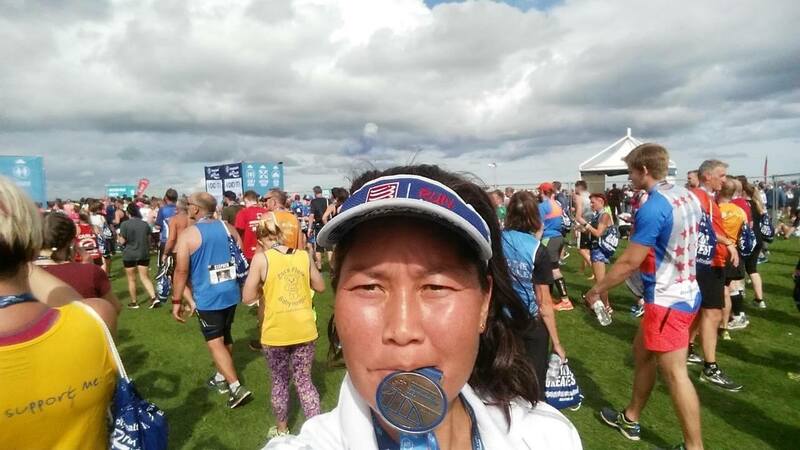 Nadia Erdenesuren a Mongolian living in England has just completed the Great North Run to raise funds for the critically endangered wild camel in her country. Nadia raised the splendid figure of £548 and exceeded her target figure of £500. Well done, Nadia, and THANK YOU on behalf of the wild camels and the Wild Camel Protection Foundation. 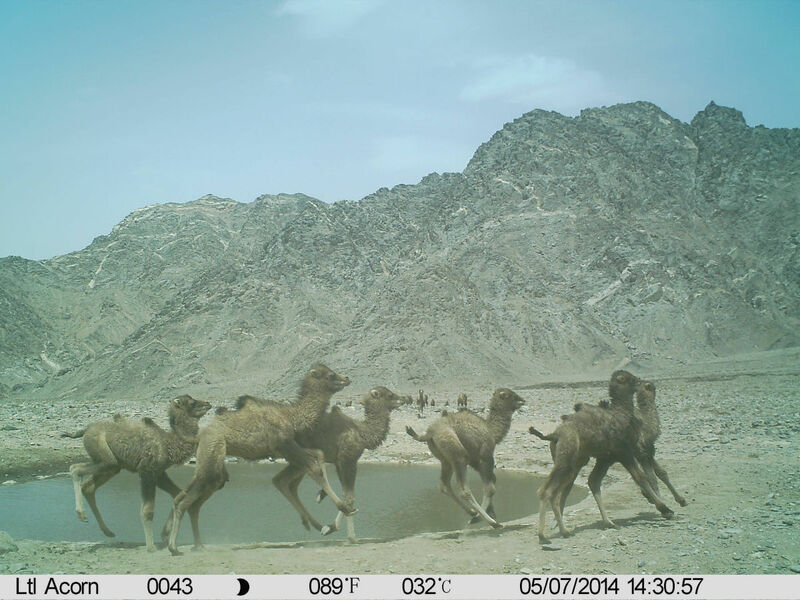 The money raised will be put towards the construction of a new enclosure where young wild camels can be held prior to their release into the Gobi desert. Rosa Nielsen, the Bactrian camel keeper from Copenhagen Zoo, has successfully completed her month-long walk from Saint Pied de Prot in France to Santiago de Compostela in Spain. 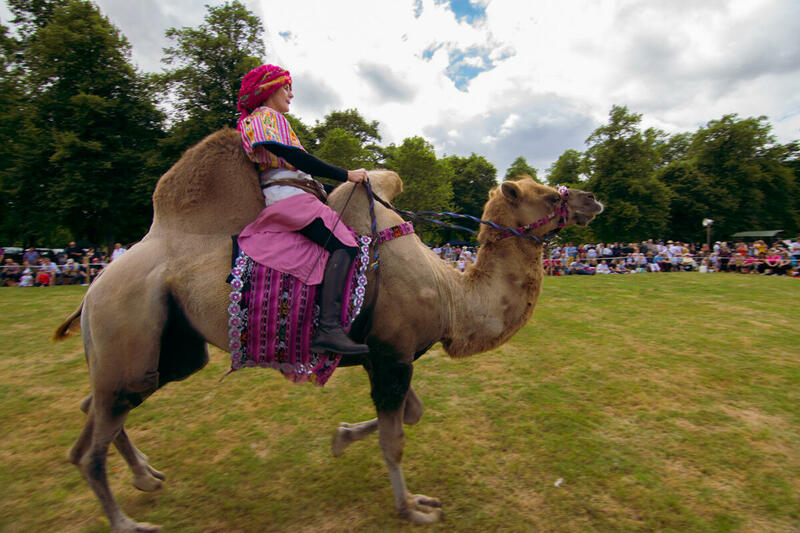 She raised the magnificent total of £2,200 for the wild camels in Mongolia. 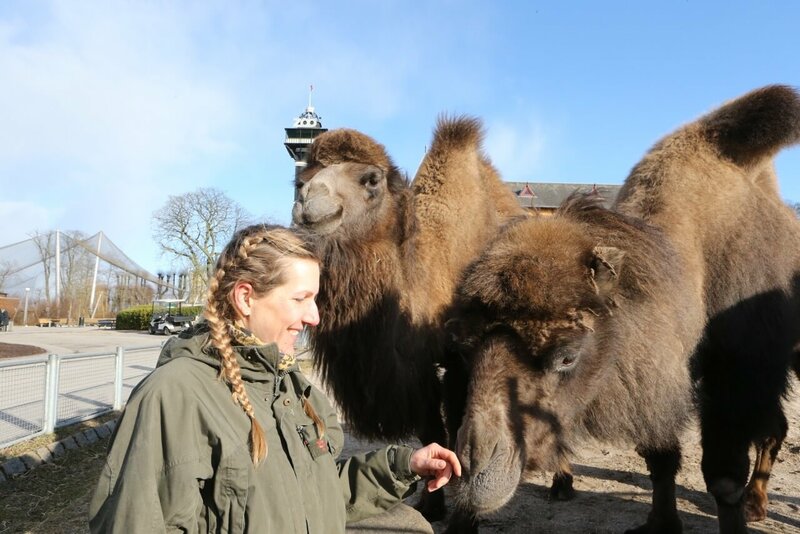 The Wild Camel Protection Foundation is deeply grateful to Rosa and to Bengt Holst the Director of the Copenhagen Zoo for allowing Rosa to undertake this fund-raising pilgrimage for the wild camels. 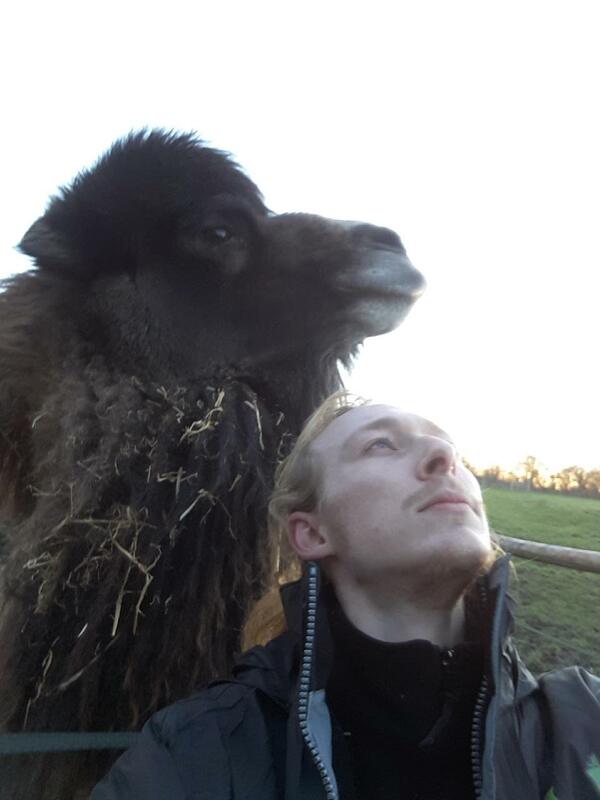 Miles Price, a 21-year-old camel keeper working at Hobbledown in Surrey where he has been looking after two Bactrian camels is shaving off his hair on May 19th to coincide with the Bactrian camels shedding their extensive winter coat. 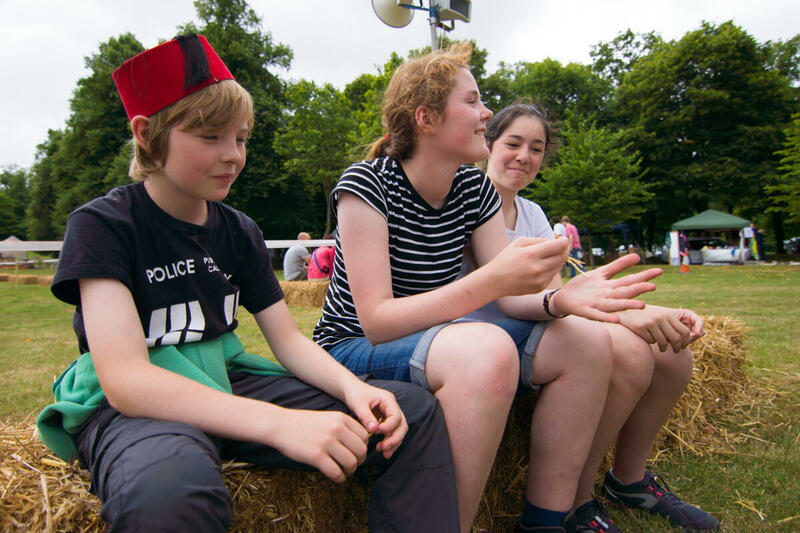 Miles is taking this drastic action to raise funds for the wild camel and we are very grateful to him for his initiative. Please support Mark by making a donation on our website to the work of the Wild Camel Protection Foundation. Mark joins Rosa Neilsen from Copenhagen Zoo who is walking to Compostela for the wild camels. She is less than a 100 kms from her goal and has already raised over £1200. Will YOU help her to reach her target of £1500 and respond to Miles’s dramatic spring moult? In April 2018, Rosa Nielson who looks after Bactrian camels at the Copenhagen Zoo in Denmark is walking from Saint Pied de Prot in France to Santiago de Compostela in Spain to raise money for the wild camels. The length of her journey is 800 kms and she intends to walk 26 kms each day. It will take her 30 days and she plans to walk during the whole month of April reaching Compostela in early May. All the money she raises will go directly to WCPF work at our breeding centre in Mongolia and this is a MAGNIFICENT UNDERTAKING on the part of Rosa and the Director of Copenhagen Zoo for which we are deeply grateful. Our Spanish colleague Alejandro Llop will be meeting her at these points to keep us posted on the progress of her journey and to take photographs. 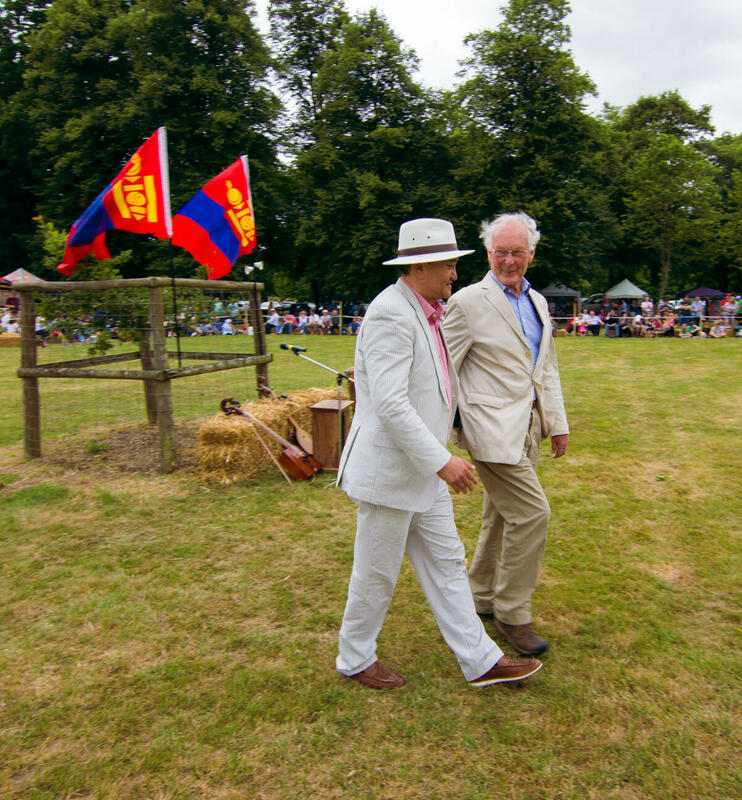 The Camel and Mongolian Day held at Buscot Park on Sunday 16th July was a great success. 300 people had a buffet lunch at 12.00pm in a magnificent and well furnished Bedouin tent. The day began promptly at 2.00pm and was opened by the Mongolian Embassy’s Minister-Counsellor and DHM, Mr. Odonjil Banzragch. 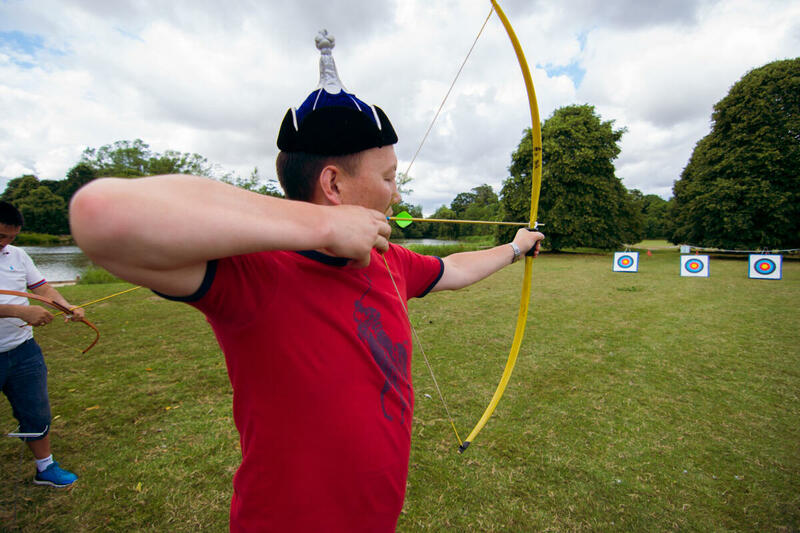 Wrestling, an amazing camel dressage display, a tug-of-war, a display of birds of prey and finally an archery contest between Mongolia and England completed the programme. 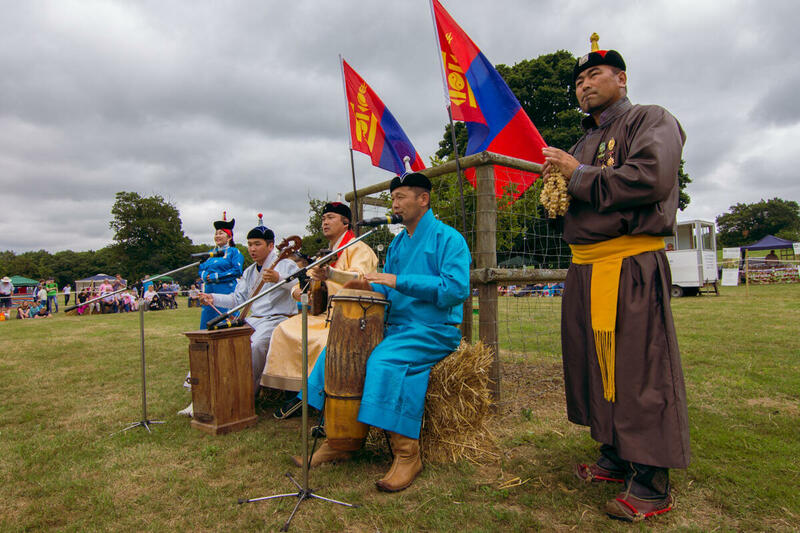 Over 100 Mongolians were present, many in colourful national dress and approximately 2,500 people attended the historic event in the magnificent surroundings of Buscot Park. This was WCPF’s sixth Camel Day and the best yet. “It was,” I might begin, “a sunny Sunday afternoon in beautiful Buscot Park in rural Oxfordshire” — and you my readers would be primed to expect a passage of bucolic prose about the joys of English parkland graced by an English stately home in an English summer. This scene, however, was very different. Two quite extraordinary Bactrian camels, their vertiginous humps swaying, mounted by two women in colourful Mongolian costume, pranced, cantered and galloped around an arena while hundreds of spectators seated on straw bales watched in amazement. “My goodness,” gasped an obvious equestrian expert, “that’s a half pass. I didn’t know camels could do that!”There was Mongolian food, Mongolian wrestling and a Britain v Mongolia tug of war. There were falconers and trained Asian birds of prey swooping and diving. Virtually the entire Mongolian embassy had motored up from London for this, a “Camels Day” at Buscot.I’ve long been a supporter of the Wild Camels Protection Foundation, and this spectacular fundraiser had been organised in honour of John Hare, who (with much help now from the Chinese and Mongolian governments) saved wild camels from extinction in the Gobi desert. He has just received the OBE.I stroked the cleft lips and velvety noses of two fine camels, patted four humps, and left with happy memories and a camel-themed sweatshirt. 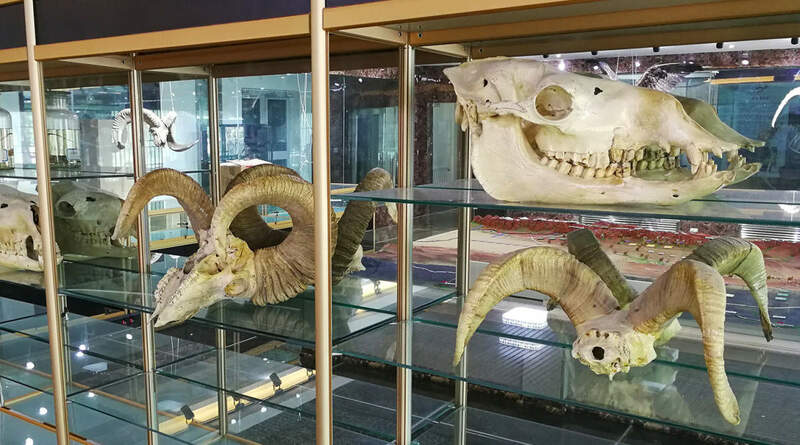 The head office of the Lop Nur Wild Camel National Nature Reserve has recently established a remarkable display of wildlife, which includes the wild camel, to be found in the reserve. 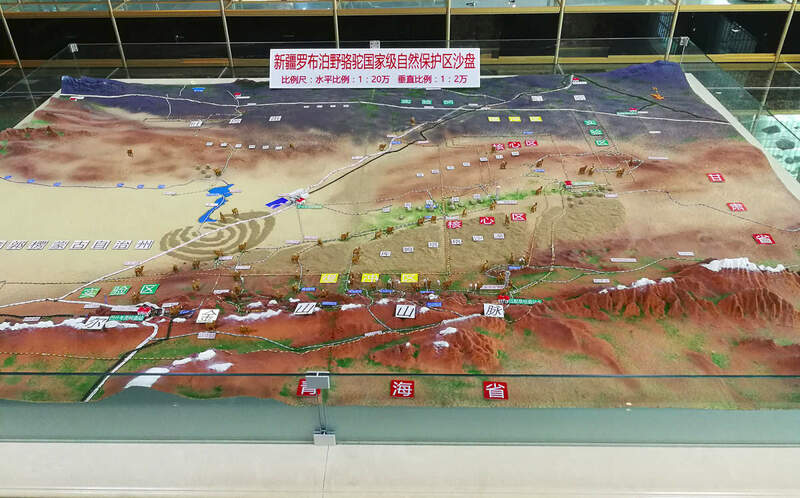 One of the photos below shows a relief map of the Reserve which is situated in Xinjiang Province, China. WCPF helped the Chinese to establish the Reserve over a five-year-period and it was finally approved by the Chinese Government in 2001. WCPF also obtained substantial funding for its establishment from the Global Environmental Facility. In 2002 WCPF successfully lobbied the Chinese Government to have the reserve classified as a National Reserve – the same status as their Giant Panda Reserve. 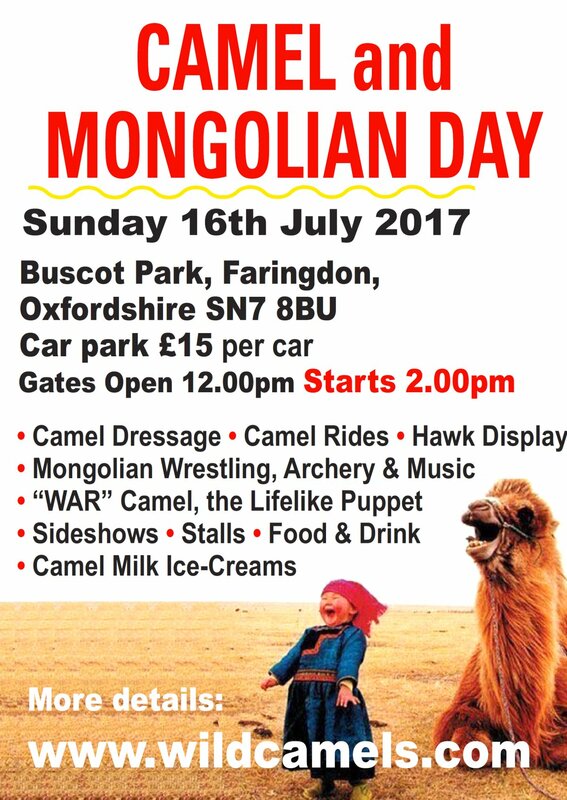 On Sunday 16th July, a Camel and Mongolian Cultural Day will be held at Buscot Park, a National Trust property near Faringdon, Oxfordshire. Camels and camel dressage will be on display and there will be Mongolian singing, wrestling, archery and other Mongolian sports. 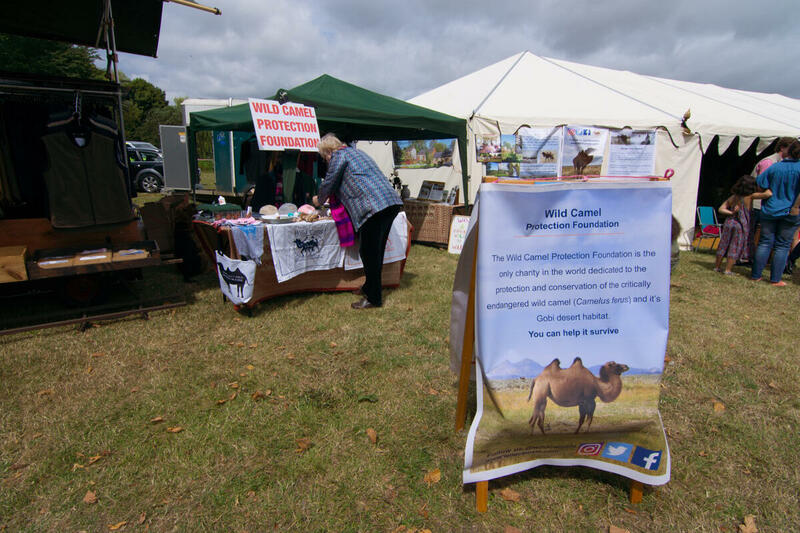 The event is organised by the WCPF to raise funds for the critically endangered wild camel – especially for winter hay for the captive wild camels at the wild camel breeding centre in Mongolia. John Hare FRGS, the first foreigner allowed into China’s former nuclear test area for 45 years, shares his remarkable experiences covering three expeditions on domestic camels to research the critically endangered wild camel in an hitherto unexplored areas of the 150,000 square kilometre, Lop Nur Desert. Discoveries include a “naive” population of wildlife trapped deep in the desert dunes which had never encountered and had no fear of man. Proceeds to the Wild Camel Protection Foundation (WCPF) – a UK registered charity – established to preserve the critically endangered wild camel from extinction. An animal which thanks to the efforts of WCPF was discovered to be in 2008 a NEW and SEPARATE species of camel which survived 43 atmospheric nuclear tests and lives on salt water with a higher content of salt than sea water. On the 19th January 2017, WCPF signed an Agreement with Altweltkamele e.V (AWK) – a German, non-profit organisation founded in 2009. Their members are camel-keepers, zoo-keepers, veterinarians and camel-holding companies in Germany and Europe. The goal of the organisation is the protection of Bactrian and Dromedary camels to which they have now added the Wild Camel as a result of this Agreement. The Agreement provides for the translation of key information from the WCPF website into German and the provision of sign boards in German publicising the Wild Camel and placed at over 90 sites all over Germany. AWK will also translate specific existing WCPF publications from English into German at AWK’s expense and both parties will seek funding for their publication. The WCPF newsletter will be translated into German and distributed to the large AWK mailing list of camel lovers and professionals throughout Germany. This is a highly significant Agreement for WCPF which will spread their message to save the critically endangered Wild Camel from extinction, throughout the German-speaking world. 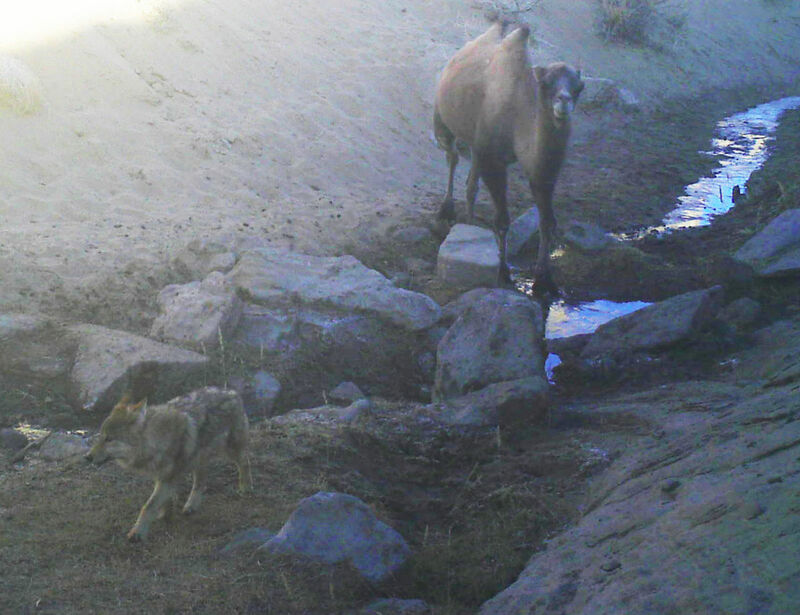 Wolves are one of the main predators of the wild camel (apart from humans) but this encounter seems to have sent the wolf scurrying away with its tail between its legs. 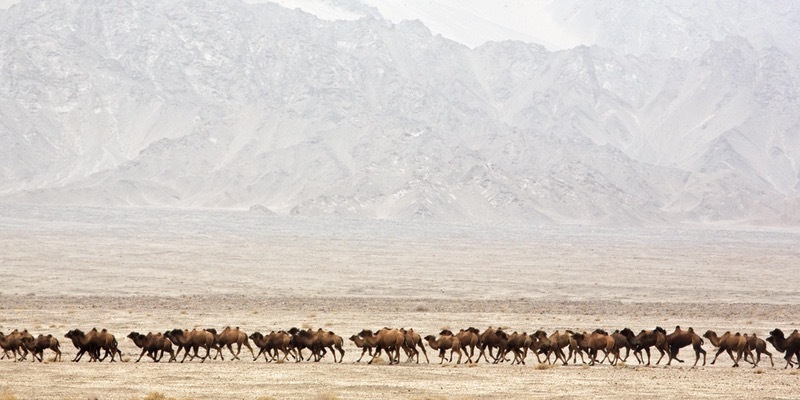 And then there is this wonderful photo of young wild camels scampering around the Lapeiquan spring in the Lop Nur Wild Camel National Nature Reserve in Xinjiang, China. It shows that a healthy crop of calves has been born and is a positive sign for the future. Both these photos were taken on a camera trip set up near the spring.